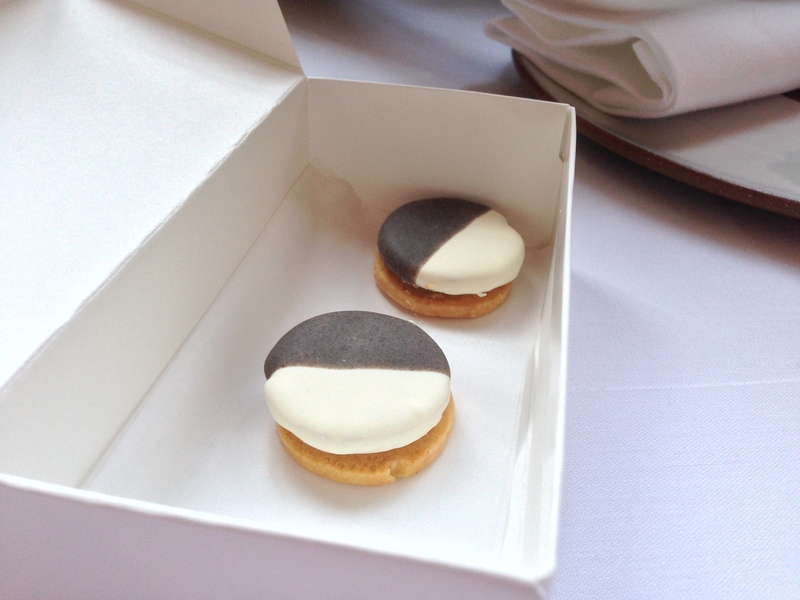 Home > Eating, New York City, North America	> NYC: Eleven Madison Park (Feb. 2014): New Menu! 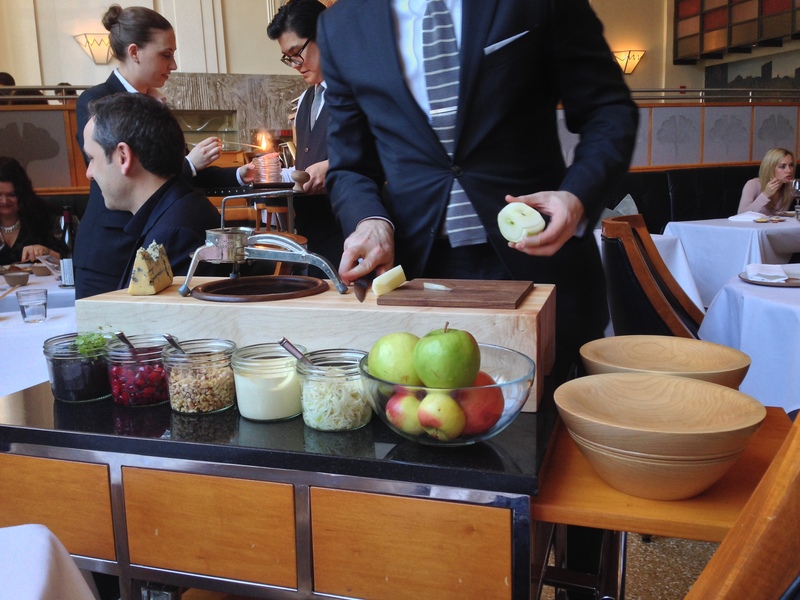 Eleven Madison Park updated their menu in late January, which is fairly recent. 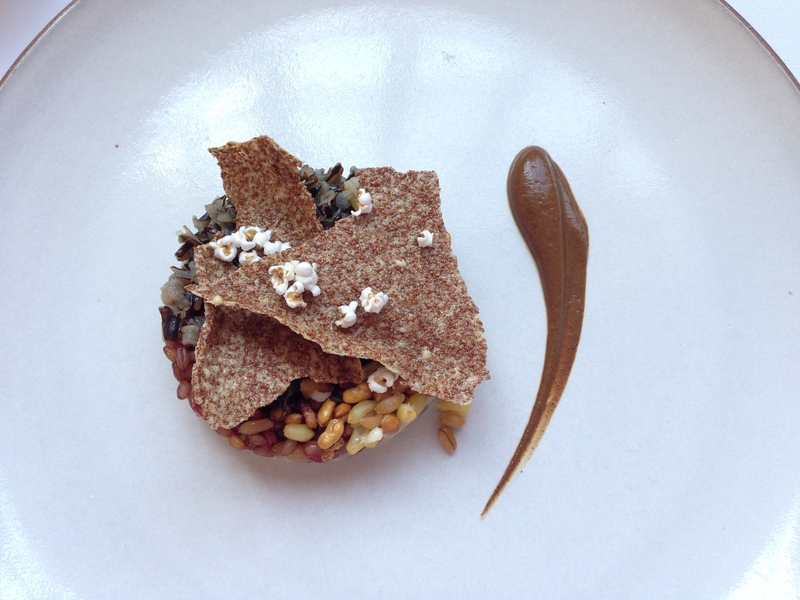 I made a reservation when I got the opportunity, and I was really excited to see what new dishes and presentations they came up with—I was also curious to see what they got rid of. Devastatingly, they got rid of my beloved egg cream. Sad times. 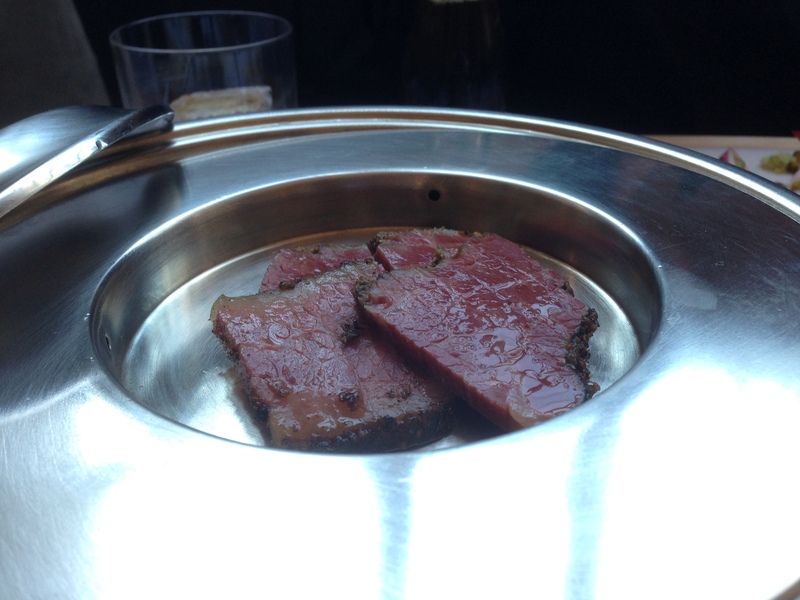 However, they added some great new dishes, like the beef pastrami course! To start the meal, we had to open a small envelope containing two tickets. We were supposed to choose the flavor that we considered the most intriguing or liked the most by taking out the symbol. Later on in the meal, we found the flavors we chose represented in various ways! 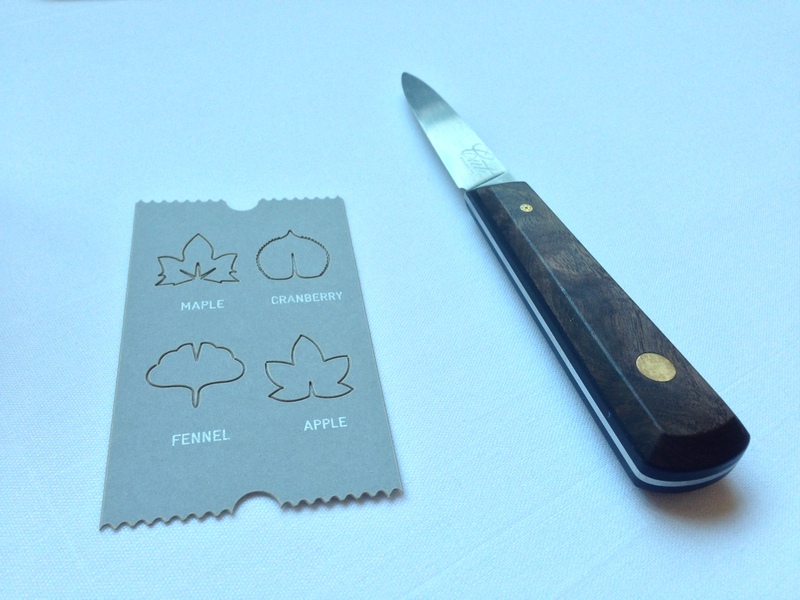 I chose maple, while Steve chose fennel. 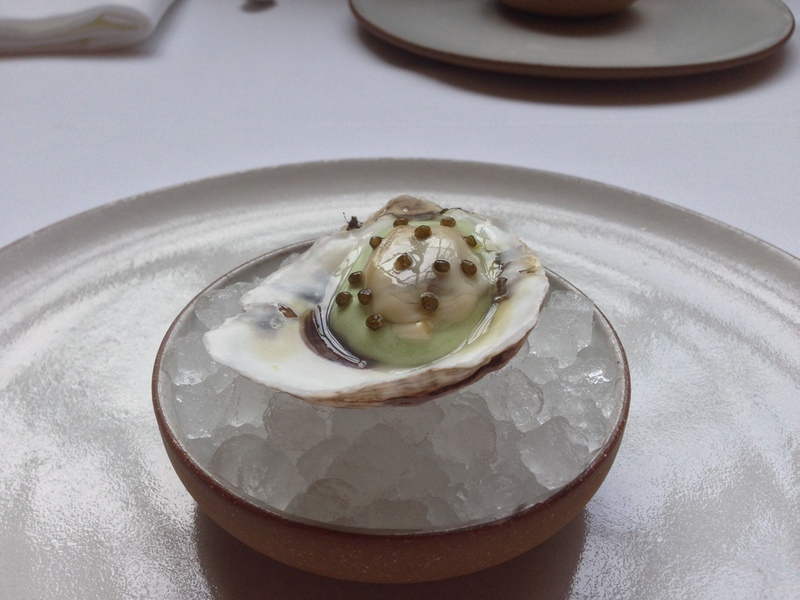 The oyster tasted like any good oyster, but what really made this amazing was the vichyssoise. It was thick and rich, but it provided a nice counter to the oyster flavor. It was like transitioning from the very light, “sea” flavor of an oyster to a thicker, “earthier” flavor of… something like clam chowder, for instance… if that makes any sense haha. This made me VERY excited to try everything that was coming up. Marinated with apple, pine, and water chestnut. This was more refreshing than anything. The scallop tasted very fresh, and the marinade made it VERY acidic. However, it was also a bit too sour for my taste. Smoked bone marrow and caviar (inside) with tartare sauce (outside—the white sauce). 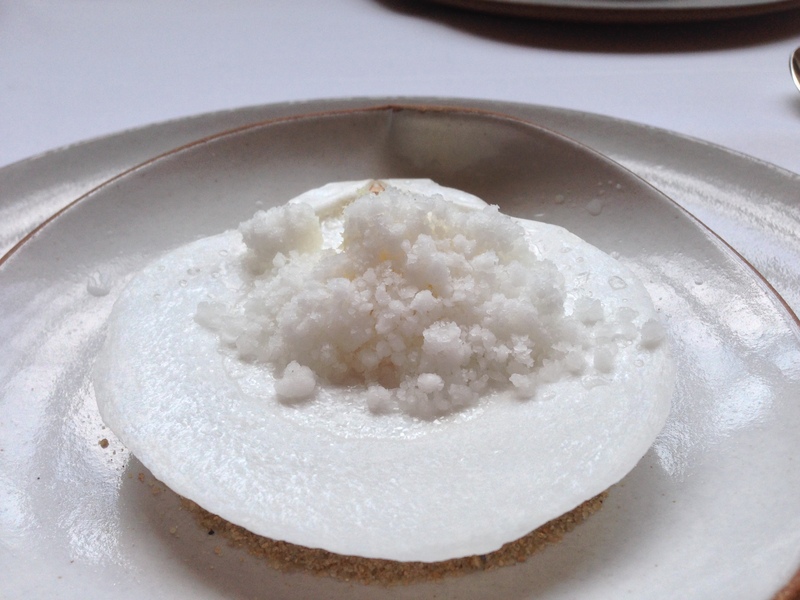 If the scallop was a representation of acidity, this was the essence of richness… and fat hahaha. It was extremely decadent and flavorful, and I actually don’t think I can do this dish justice with words. 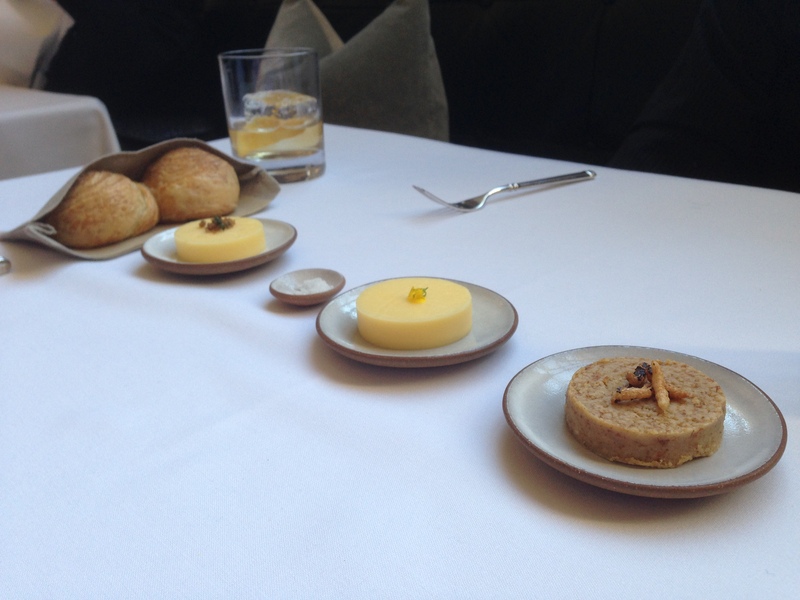 I mean… you have the flavors of bone marrow, caviar, and tartare represented very intensely here. Boom. You have to go try EMP for yourself and taste this! Pastrami with rye bread, pickles, onion, cucumber, mustard, and maple soda. This dish pays homage to the great New York delis (the most famous of which is Katz’s Deli) by serving an open-faced sandwich with delicious, juicy pastrami. The pastrami was amazing, but I kind of wish there were more rye bread. Also, that maple soda is AMAZING. It’s really flavorful but does a good job of not being too sweet. It was a great compliment to the pastrami sandwich. According to our waiter, no deli experience is complete without soda—and he was right. Dehydrated sunchoke with pear, buttermilk, and black truffle. The sunchoke crisps added a nice crunch to the salad, and this crunchiness (coming from dehydrated fruits/vegetables, chips, or even nuts) is something I’m coming to appreciate more and more. It definitely makes salads more satisfying to eat and, in some ways, more delicious. Oscar Tschirky was maître d’hôtel of Delmonico’s Restaurant and then the Waldorf-Astoria Hotel in NYC. 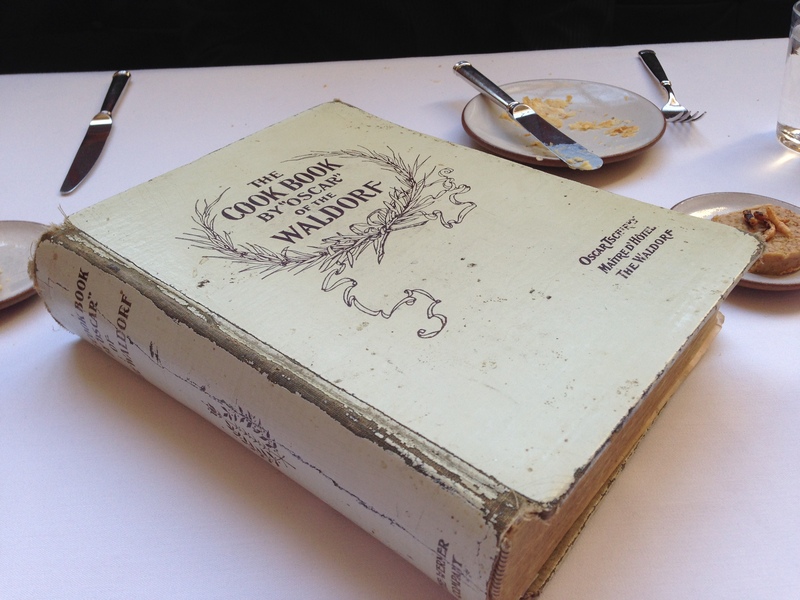 He was famously known as “Oscar of the Waldorf” and even published a large cookbook, which the restaurant presents for your viewing. 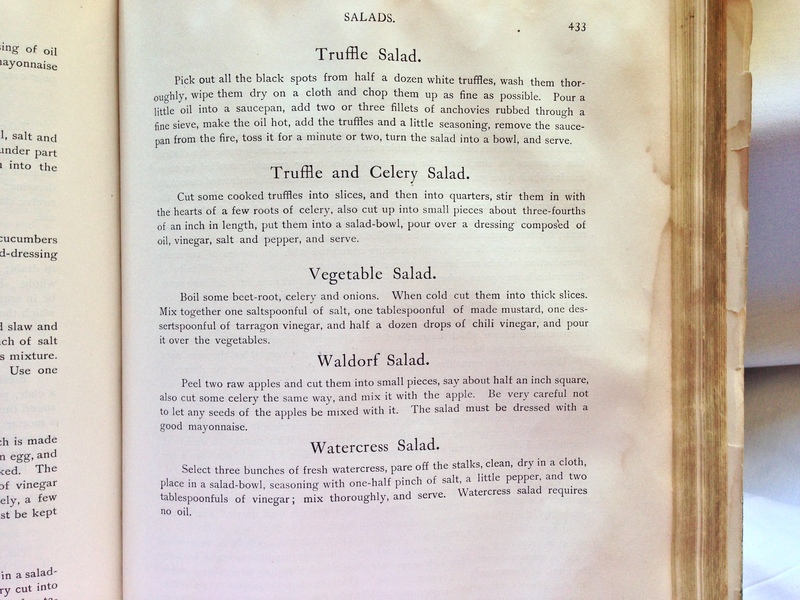 You can find the recipe for the Waldorf Salad on page 433. Salad with apple, celery, cranberries, bleu cheese, and candied walnuts. You start off with a rather big bowl that has two levels, the first of which contains the salad. This salad was very refreshing and acidic; the other ingredients also tempered the taste of the bleu cheese, which I usually dislike a little (but tolerate). The candied walnuts also added some welcome “crunch” to each bite. When you lift up the top layer of the bowl, you reveal a “breakfast” at the bottom level. Honestly, I found this part of the course to be a bit mediocre and forgettable. It just didn’t have any “wow” factor to it. 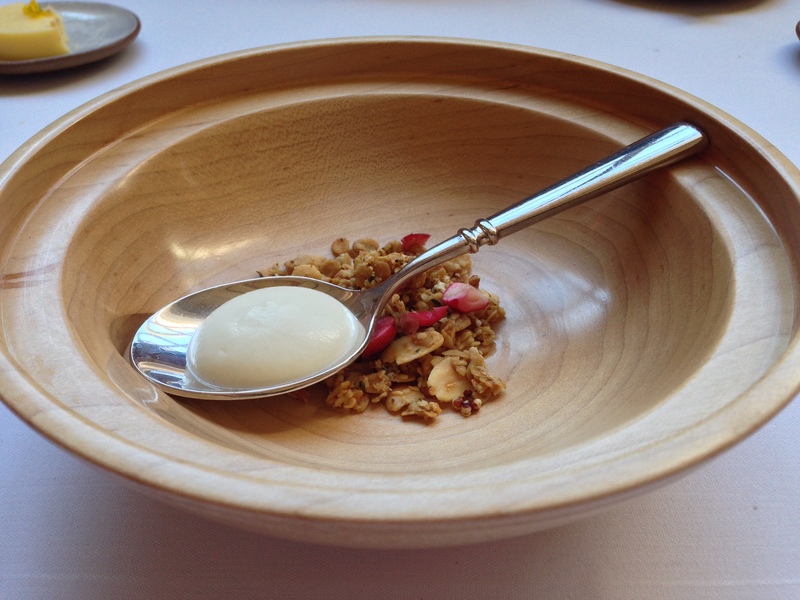 It just tasted like plain ol’ yogurt and granola. Maybe that was the point…? Or maybe I’m missing something. Hmm. 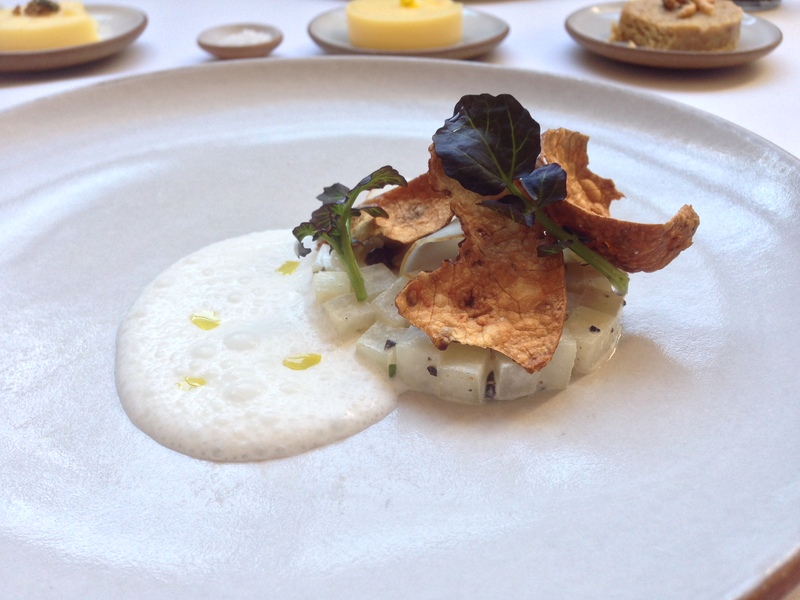 Top: Razor clam marinated in lemon with trout roe and kale sauce. Right: Lobster claw stuffed with lobster salad. 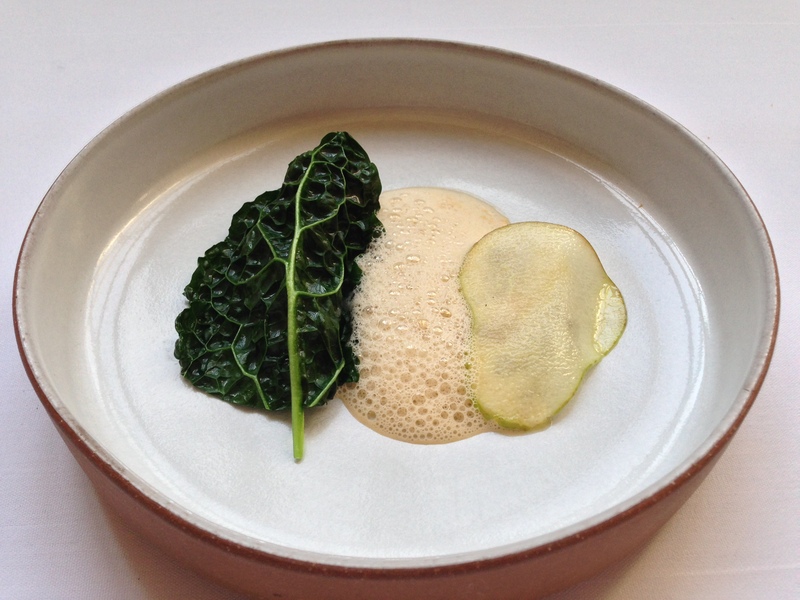 This dish is meant to be a light preview of the upcoming dish. The lobster salad was delicious, while I found the uni panna cotta to be too sour. Olive oil–poached Maine lobster (underneath the kale) with uni foam, kale, and razor clam under pear marmalade. This dish is the big brother (and much more satisfying dish) of the previous dish haha. 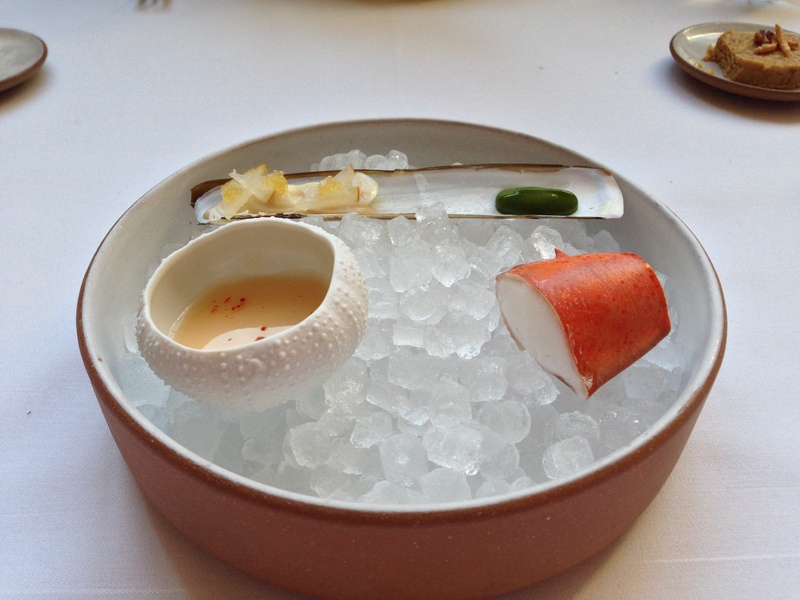 The same elements of lobster, uni, razor clam, and kale are here. The lobster was good, but it was also a little underwhelming. 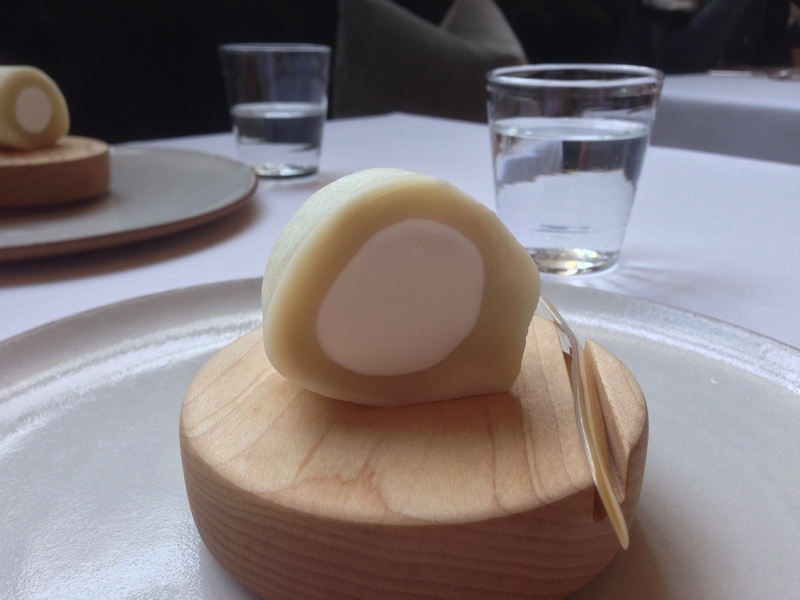 Having just eaten at Per Se the day before, I couldn’t help but compare this to Keller’s butter-poached lobster, which I felt was more intensely flavorful. 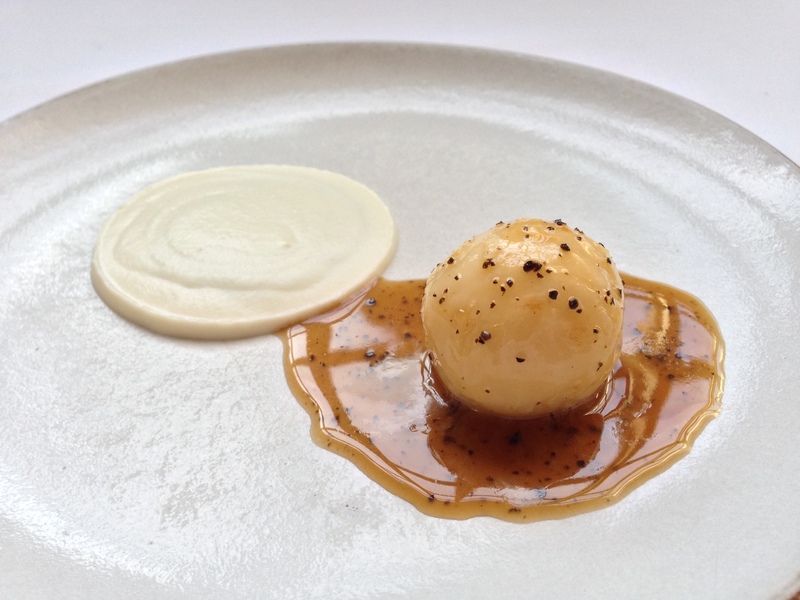 Braised celery root with black truffle jus, celery root purée, and black truffle purée. 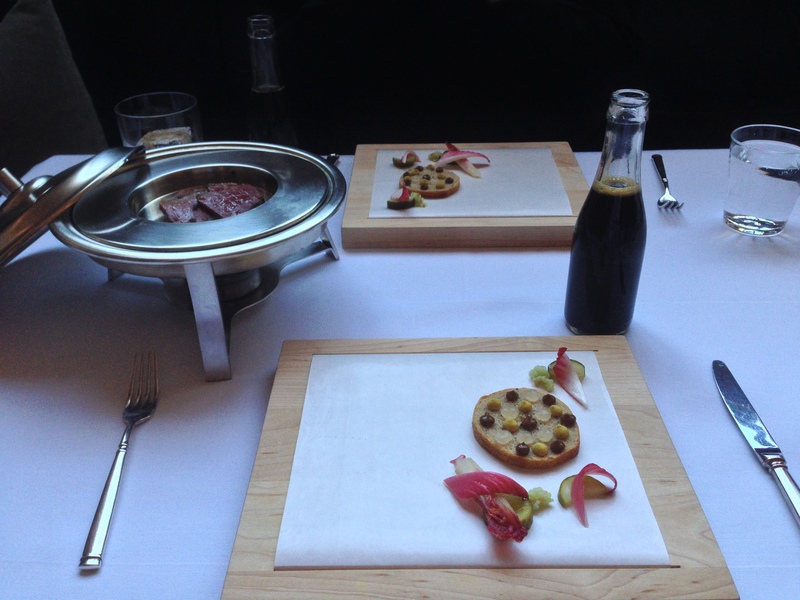 Everything about this dish was very earthy and rich, from the two different purées to the black truffle jus. The black truffle flavor complemented the celery flavor really well, and the celery root itself was very, very tender and soft—I have definitely not had celery root that soft before! 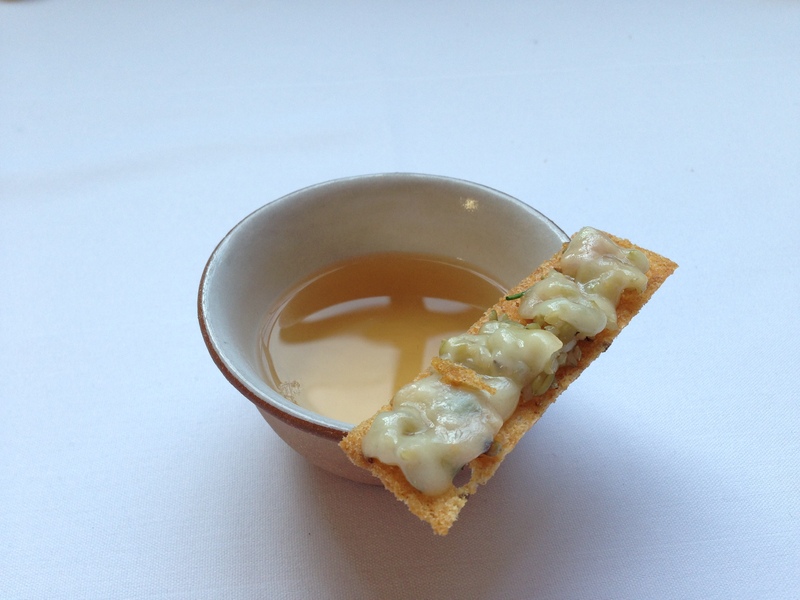 Freekah consommé with rye crisp, whole grains, Gruyère cheese, and mustard seeds. Risotto made from freekah and teff grain, parsnip, fermented black beans, and whole grain purée Served with a salad of bitter greens. I actually didn’t like this vegetarian dish :(. The first few bites were good, but the latter half definitely consisted of diminishing returns. 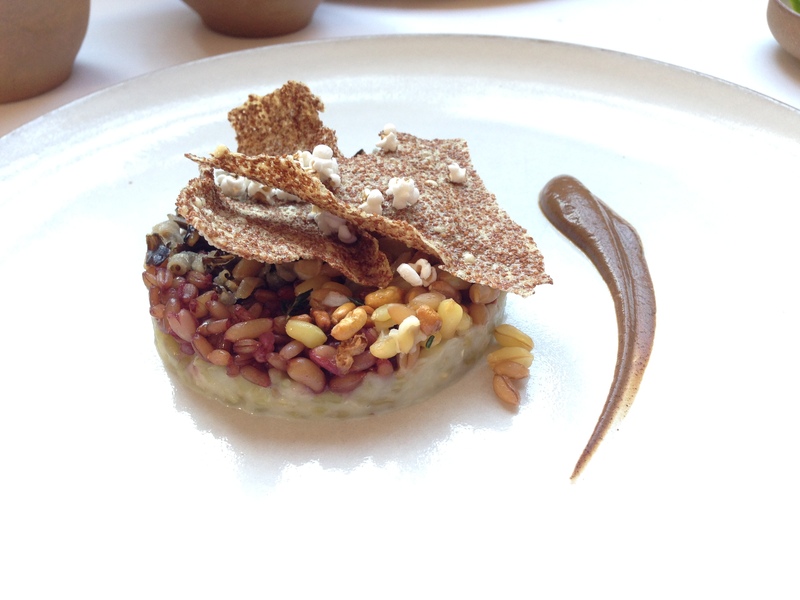 While the bottom consisted of risotto, the top consisted of too many harder grains (texture-wise). Everything had a “bite” to it, and having so much “crunch” admittedly made eating this more satisfying (and slightly more delicious) than it otherwise would have been. However, the side effect to having so much “crunch” was that it also became tiring to eat this after a few bites had passed. There also wasn’t really any acidity here save for the few bitter greens, which definitely contributed to my getting sick of eating this. Duck broth with sausage and Gruyère cheese. 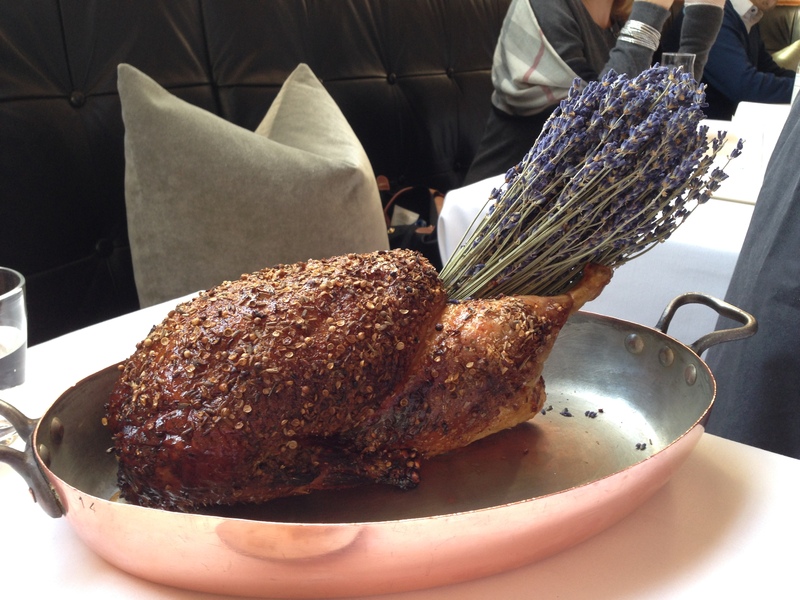 12-day–aged Muscovy duck roasted with lavender, honey, and rutabaga. 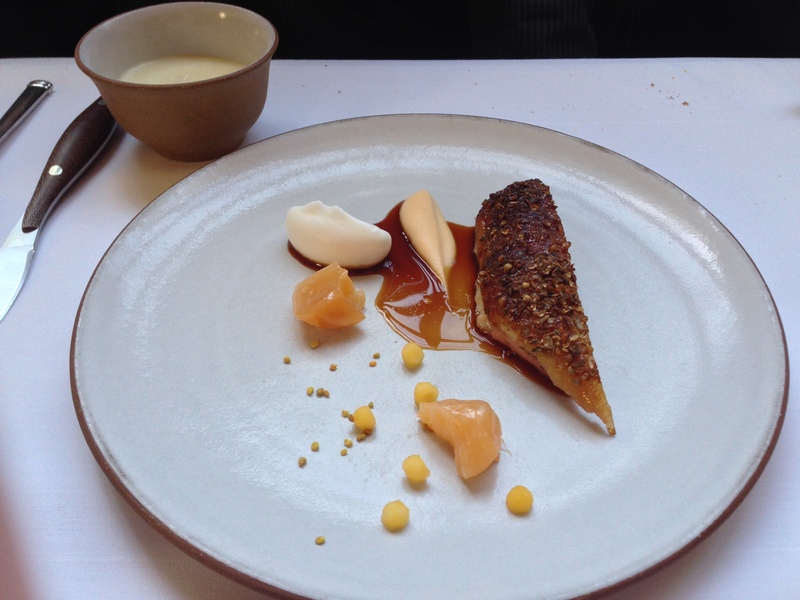 The waiter also mentioned foie gras in one of the sauces, but I forgot the details :(. 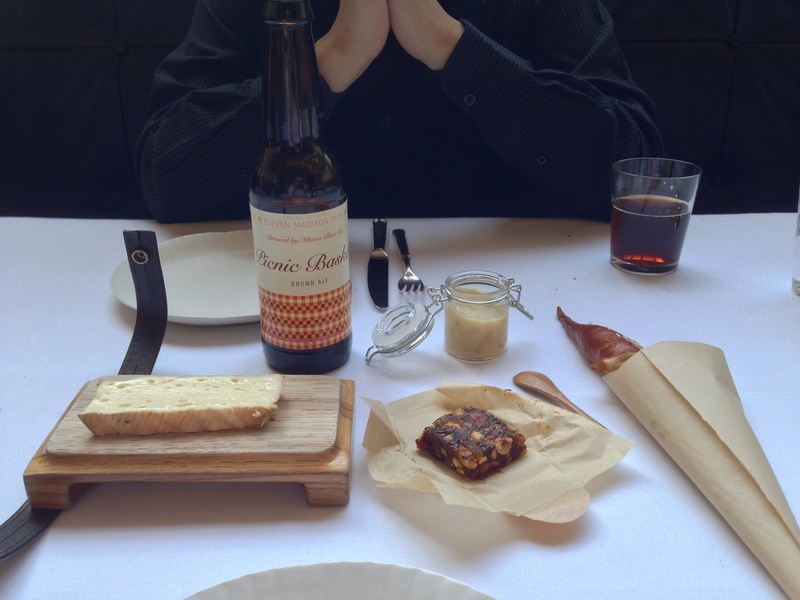 Greensward cheese (cow’s milk cheese), “brown ale”, pretzel bread, sweet onion jam, and dried fruit cake. The cheese was washed in the beer, the onion jam has hints of the beer, and the pretzel bread also has a hint of the beer. The whole course revolved around the beer, which is custom-brewed for the restaurant by Ithaca Beer Co.! 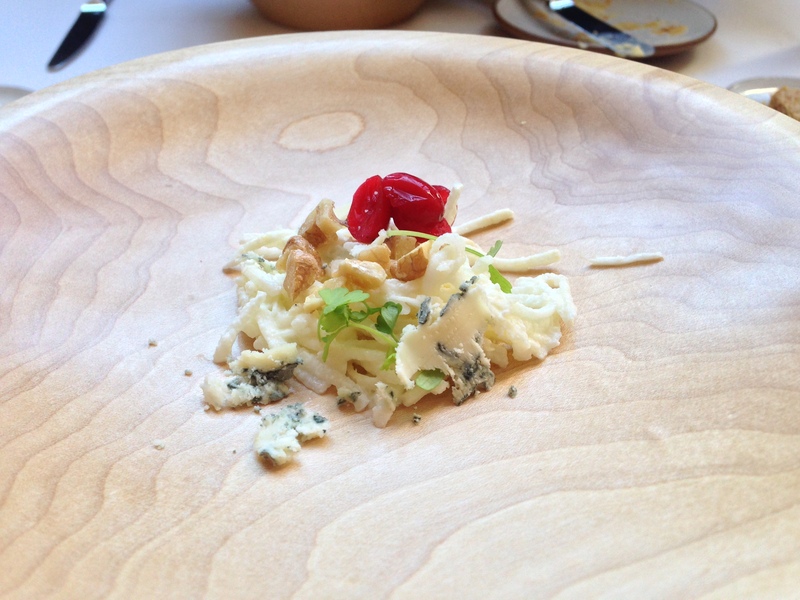 This is starting to feel like a pretty old dish, and it makes me wonder when they’re going to update their cheese dish. It’ll very likely be sooner or later. After all, EMP is all about change! 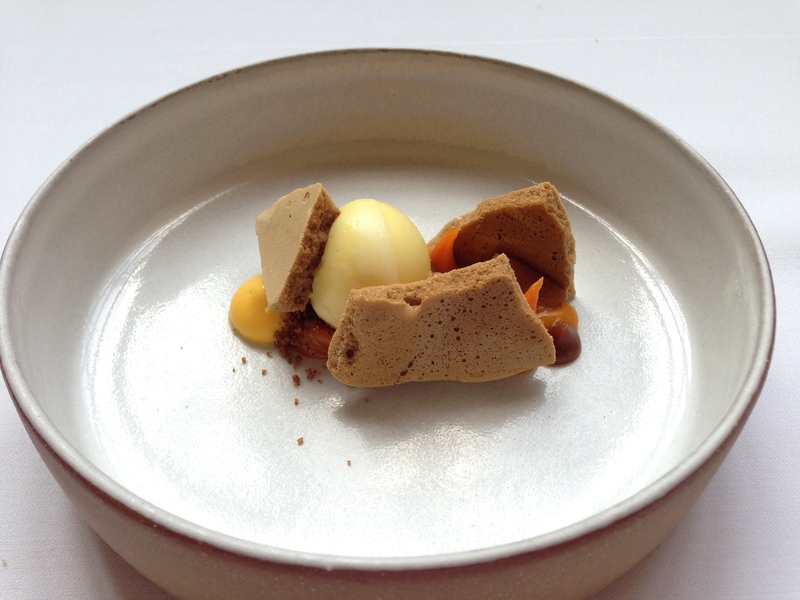 Curd with expresso meringue and orange sorbet. This was a great palate cleanser. The sweet potato, expresso, and orange flavors complemented each other really well. They managed to be neither too sweet nor heavy either alone or in combination with each other. 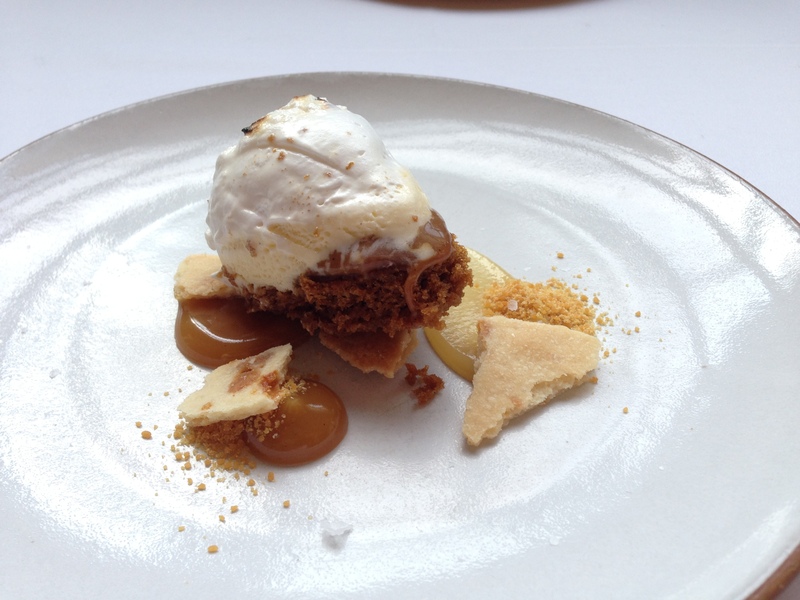 There was also a great array of textures, from the crispiness of the meringue to the softness of the curd. 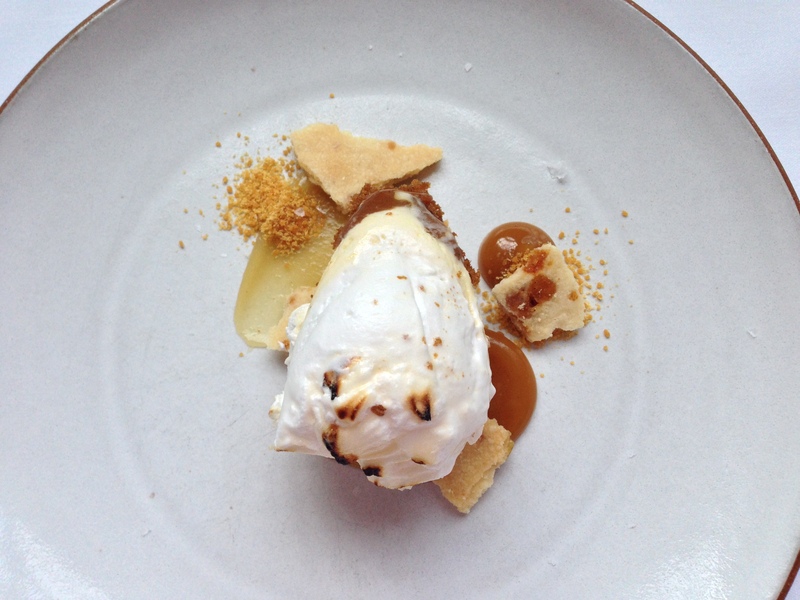 Vanilla “Baked Alaska” with molasses cake, rum, raisin, and maple. 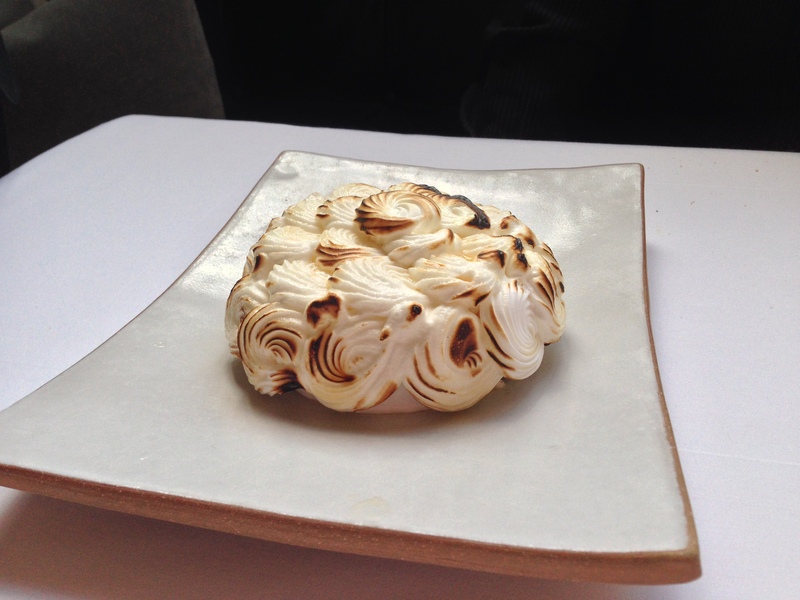 The waiter brought out ice cream that was insulated by a meringue; he then proceeded to pour hot liquid over the meringue, firming and browning it. 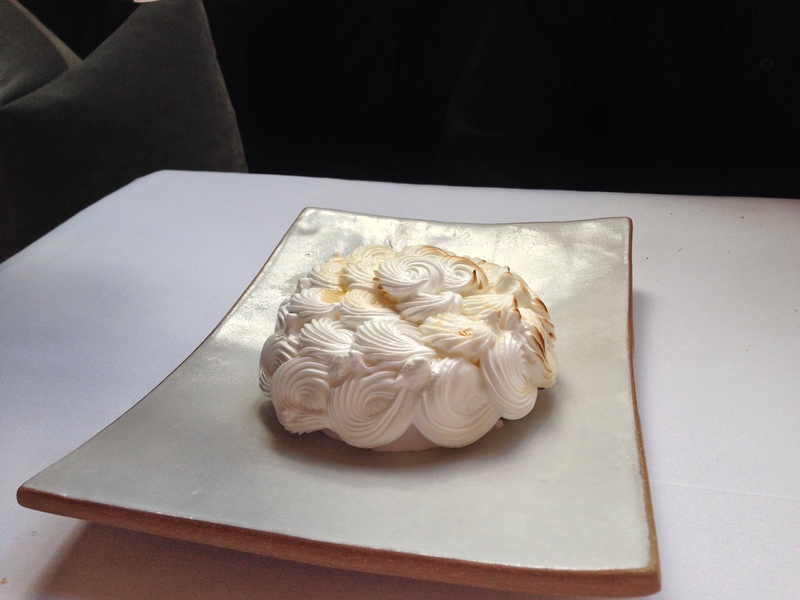 While doing this, he explained the history of the “Baked Alaska”. The presentation was definitely fun to watch and made us excited to try the upcoming dessert. 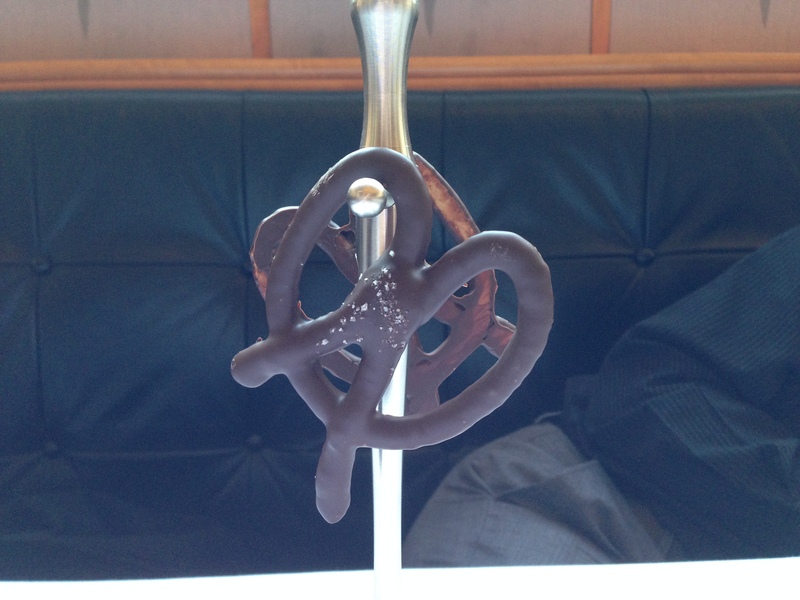 White chocolate pretzel covered with Mass Brothers’ dark chocolate and sea salt. Well, I guess this last part of the meal hasn’t changed. It’s still just as delicious. 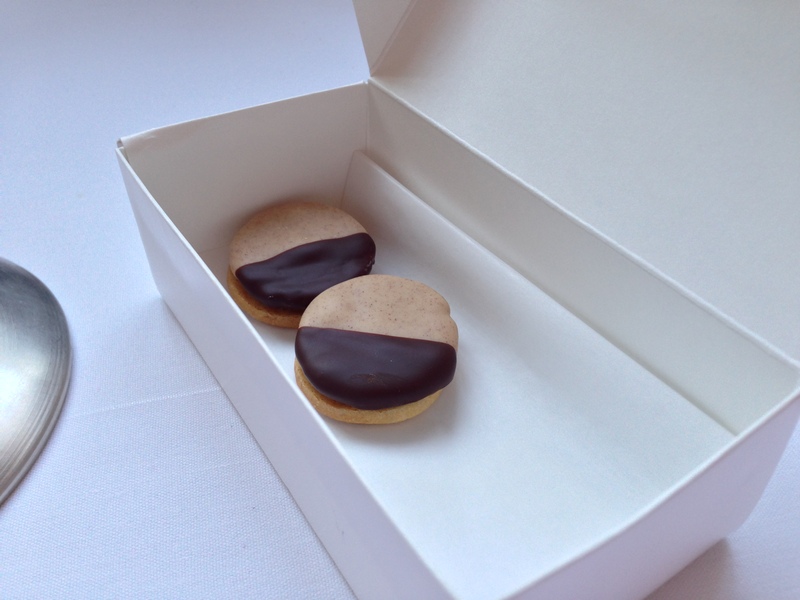 Sweet black-and-white cookie with cinnamon. Like how it’s been for years, you end the meal with a bottle of a digestif to enjoy. We got two bottles, and I had not been drinking alcohol the whole night—the staff wanted to give me something non-alcoholic to drink. 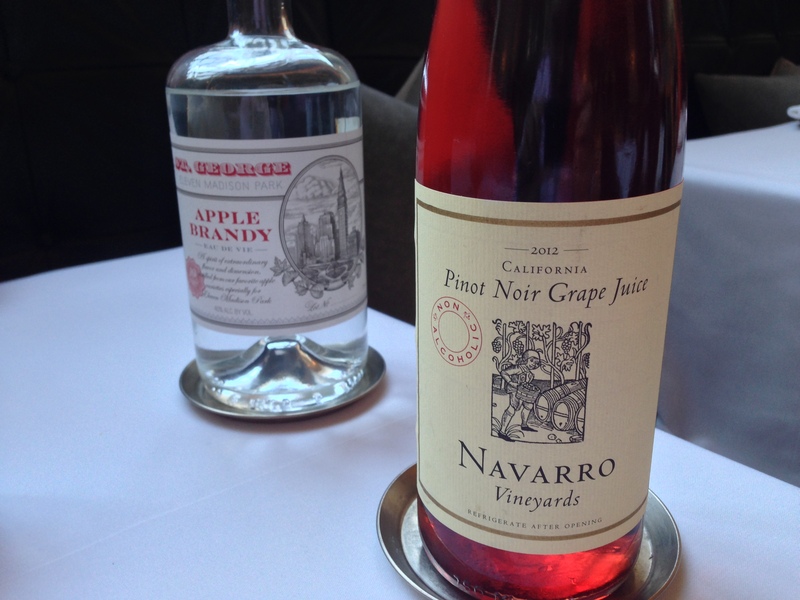 As a result, my friend drank the apple brandy, while I drank a little of the Pinot Noir grape juice. The food was just as wonderful as I had remembered it to be. It was a great meal and experience! of all the places to eat in NYC is this the one? yeah, i’d say that this is the place to eat in NYC right now. a lot of the dishes revolve around the history and traditions of new york, and that sets it apart from some of the other top restaurants.